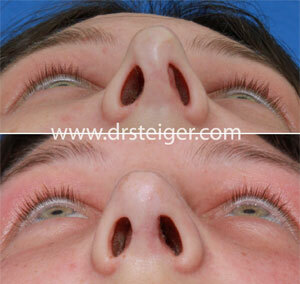 Goals: This patient had revision rhinoplasty after having two prior nasal surgeries. 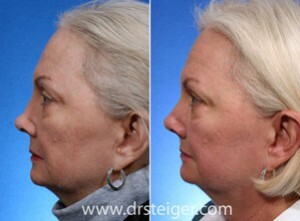 In her prior surgeries too much cartilage was removed from her nose that resulted in a collapsed nose, also called a saddle nose. 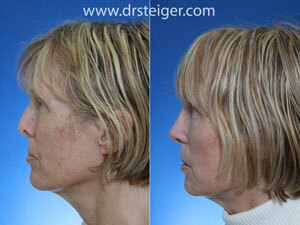 Dr. Steiger repaired her nose using her own rib cartilage graft to replace the missing cartilage and fix the nose. Extended spreader grafts, a caudal extension graft, lateral crura strut grafts and soft tissue graft were needed to repair her nose. After her revision nose surgery she looks better and can breath much better as well. 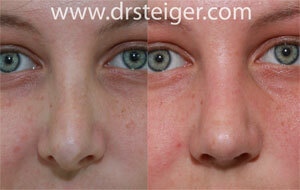 Her saddlne nose and collapsed nostrils are now repaired. 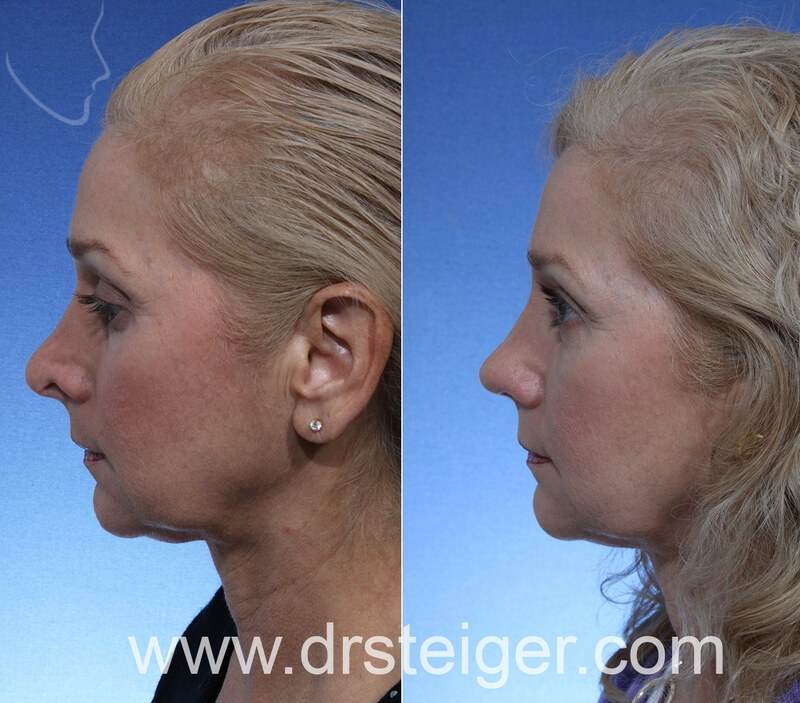 Goals: This patient had three previous rhinoplasty procedures where too much cartilage and bone was removed from her nose. This resulted in collapse of her nasal tip, alar retraction (excessive lifting of her nostrils), and significant nasal obstruction. 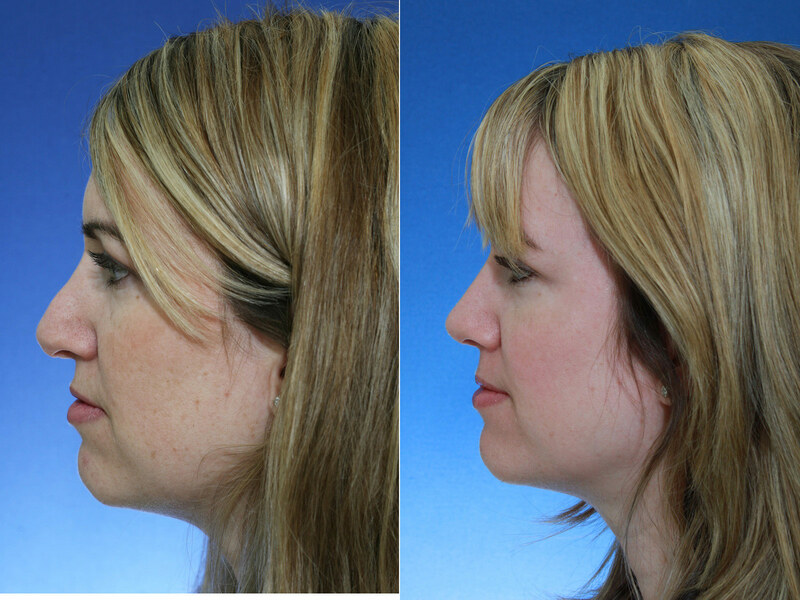 Revision rhinoplasty was performed to repair her nose using donor rib cartilage to replace the missing cartilage and bone. 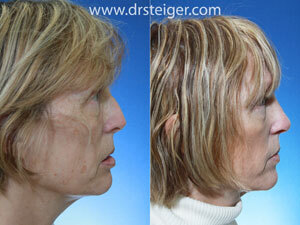 Goals: This patient had two previous rhinoplasty procedures and was unhappy with the appearance. Revision rhinoplasty was performed to repair her drooping nasal tip (long nose), fix the pollybeak deformity, and resupport her collapsed nostril. She is seen here 1 year after surgery with a shorter nose, more natural appearing nose, strong nasal base, and imporved profile. 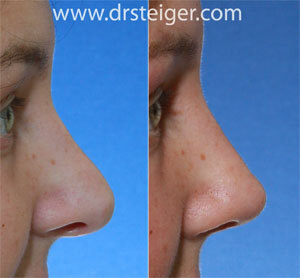 Goals: Revision rhinoplasty was performed in order to repair her nose. Before her nasal surgery she had a pollybeak deformity, a hanging collumela, collapse of her nostrils, and a twisted nasal tip. 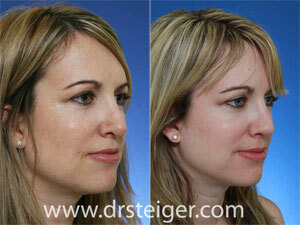 A revision nose job was performed using cartilage from her ear to repair the nose. 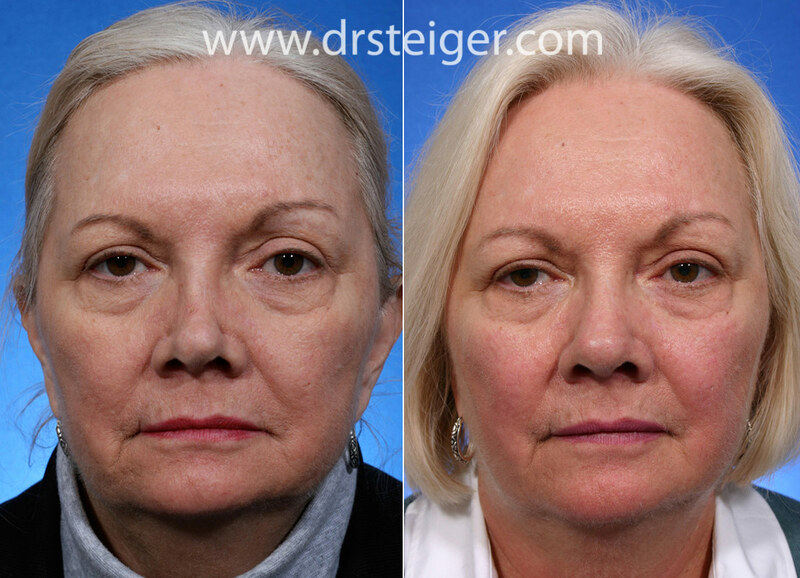 Her appearance and ability to breath are markedly improved after surgery. 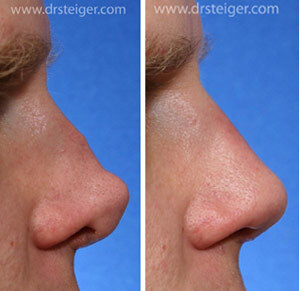 Goals: Revision Rhinoplasty (nose job) was performed on this man in order to repair the unnatural appearance of his nose. 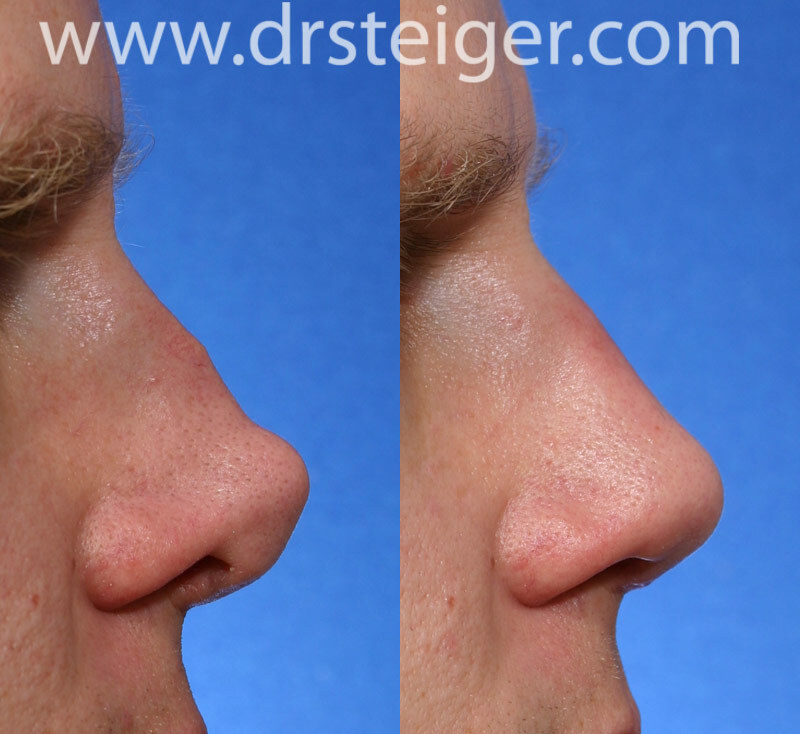 Rib cartilage was used to reconstruct his nose and achieve a more natural appearance. 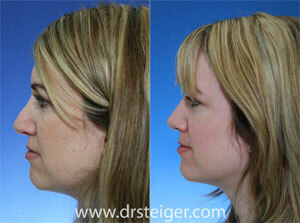 Goals: This revision rhinoplasty patient had a previous nose job that resulted in severe elevation of her nostrils. 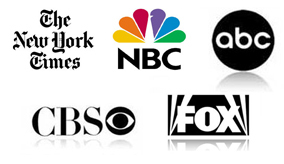 This is called alar retraction. Dr. Steiger performed revision rhinoplasty on her in order to correct the alar retraction and give her nose a more natural appearance. Dr. Jacob D Steiger MD is South Florida facial plastic surgeon board certified by the American Board of Facial Plastic and Reconstructive Surgery and the American Board of Otolaryngology- Head & Neck Surgery. He practices in Boca Raton and Delray Beach, Florida treating patients from Palm Beach, Ft. Lauderdale, Miami, as well as patients from all over the US and from around the world.